BAGG, STANLEY CLARK, notary, large landowner, justice of the peace, president of the Numismatic and Antiquarian Society of Montreal and of the English Workingmen’s Benefit Society; b. 22 Dec. 1820 at Montreal, only son of Stanley Bagg, an important businessman, and of Mary Ann Clark; d. 8 Aug. 1873 in his birth-place. At the end of the 18th century Stanley Clark’s paternal grandfather, Phinehas Bagg, emigrated with his family from Massachusetts to Montreal. During the same period his maternal grandfather, John Clark, moved from England to America. At his death he left large estates in Durham County, England, to his daughter Mary Ann. Stanley Clark, his grandson, inherited a substantial number of the properties he owned in Montreal. His father worked in business and took part in the political life of Lower Canada; he was one of the principal figures in the Montreal West election of 1832 [see Mondelet; Daniel Tracey*]. Stanley Clark Bagg began his studies under the direction of a Church of England minister and completed them at McGill College. He became a notary on 31 May 1842 and carried on his profession for 14 years; following the death of his father, he gave it up to devote himself to managing his property. He was at that time the largest landowner on Montreal Island after the Sulpicians. He was to give the town the land necessary for the building of several streets and squares. A die-hard Conservative, Bagg was a close friend of John Alexander Macdonald*. He refused to run for parliament but none the less worked for the party. During the insurrection of 1837 he had shown his loyalty to the crown by enlisting as a standard-bearer, and he took part in the battle of Saint-Eustache. 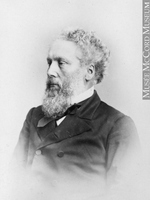 The fact that he was chosen to fill the post of justice of the peace for the district of Montreal in 1859 is evidence of his capability, and of the respect in which he was held by the civil authorities. In the following year he took an active part in Montreal’s reception of the Prince of Wales, on the occasion of the opening of Victoria Bridge [see Hodges]. In January 1865 a deputation of seven representatives, from each district of the town of Montreal, asked him to stand as a candidate for the mayoralty, but he refused, since he was more concerned with various philanthropic projects and with the cultural progress of his fellow-citizens. Stanley Clark Bagg was interested primarily in numismatics and archaeology. Adélard-Joseph Boucher*, Joseph-Amable Manseau, and he met at the houses of one or the other to discuss their favourite occupation and to share their discoveries. From these small gatherings grew the idea of a society. The Numismatic Society of Montreal, already with 20 members, was in actual fact founded on 9 Dec. 1862. The object of the new association was to study numismatics and to set up both a collection of medals and coins and a library. In 1866 it became the Numismatic and Antiquarian Society of Montreal, giving an important place to the study of archaeology. In 1872 the society started a journal, entitled Canadian Antiquarian and Numismatic Journal, which was intended to make its principles and its activities more widely known. The society’s main task was, however, to establish a museum of Canadian archaeology and numismatics in the building known as the Château de Ramezay, whose construction went back to the year 1705. Bagg was president of the society in 1866–67. Being anxious to share his knowledge with his fellow-citizens, Bagg published numerous scientific articles in the local newspapers. The English and American press also published his research, which they considered to be of great value. Among his principal writings may be mentioned: Notes on coins . . . (1863), Coins and medals as aids to the study and verification of holy writ (1863), A chronological numismatic compendium of the twelve Caesars . . . (1864), Archæologia Americana (1864), Canadian archæology (1864), and a lecture, The antiquities and legends of Durham . . . (1866). His insatiable liking for new discoveries, his spirit of initiative, and the need to exchange his knowledge with other scholars led Bagg to join various local or international scientific associations, and to remain in contact with foreign researchers. He became a life member of the British Association for the Advancement of Science, the Natural History Society of Montreal, the Mechanics’ Institute, and numismatic societies in London and Philadelphia. He was in addition a corresponding member of the Wisconsin State Historical Society. Stanley Clark Bagg also took an interest in several philanthropic organizations. He was one of the founders of the English Workingmen’s Benefit Society, and its first president. This benevolent society rendered inestimable service to hundreds of families who were forced to have recourse to it. A life member of the Young Men’s Christian Association, founded in 1851 at Montreal, Bagg also accepted the responsibilities of the vice-presidency of the Montreal dispensary and the office of governor of the Protestant House of Industry and Refuge. Furthermore, he was the author of a number of hymns composed specially for Christmas, Good Friday, Easter, and Ascension Day. On 9 Sept. 1844 at Philadelphia Stanley Clark Bagg married Catharine, eldest daughter of Robert Mitcheson and Frances MacGregor, who was said to be descended from the old Scottish kings. They had one son, Robert Stanley, and five daughters, Mary Ann Frances, Katharine Sophia, Amelia Josephine, Mary Heloise, and Helen Frances Mitcheson. Stanley Clark Bagg died on 8 Aug. 1873 at the family manor-house, Fairmount. He was a worthy representative of what one might call the Anglo-Saxon “establishment” of Montreal. The municipality of Montreal officially designated the streets Clark, Bagg, and Fairmount in his honour. S. C. Bagg, The antiquities and legends of Durham, a lecture before the Numismatic and Antiquarian Society (Montreal, 1866); Archæologia Americana (Montreal, 1864); Canadian archæology (Montreal, 1864); A chronological numismatic compendium of the twelve Caesars, and a summary of remarkable events from the birth of Julius Caesar, B.C. 100, to the death of Saint John the Evangelist, A.D. 100 (Montreal, 1864); Coins and medals as aids to the study and verification of holy writ (Montreal, 1863); Notes on coins: being the first paper read before the Numismatic Society of Montreal (Montreal, 1863). AJM, Greffe de Stanley Clark Bagg, 1842–1856. Can. biog. dict., II, 43–45. Morgan, Bibliotheca Canadensis, 15. Atherton, Montreal, III, 406–10. Borthwick, Montreal, 42. Lareau, Hist. de la littérature canadienne, 352–53. Toponymie (Service d’urbanisme de la ville de Montréal, Bulletin d’information, no.4, [Montréal], 1966), 35. “In Memoriam, Stanley Clark Bagg, esq., J.P., F.N.S.,” Canadian Antiquarian and Numismatic J., II, no.1 (1873), 73–78. Victor Morin, “Clubs et sociétés notoires d’autrefois,” Cahiers des Dix, XIV (1949), 212–13. Léon Trépanier, “L’historique de nos noms de rues,” La Patrie (Montréal), 22 mai 1949. Ancestry.com, “Pennsylvania and New Jersey, church and town records, 1708–1985”: www.ancestry.ca (consulted 4 April 2017). Bibliothèque et Arch. Nationales du Québec, Centre d’arch. de Montréal, CE601-S3, 12 janv. 1798; CE601-S63, 25 Dec. 1805, 2 July 1822, 26 July 1827, 14 Oct. 1845, 21 Oct. 1847, 8 Aug. 1848, 23 July 1850, 8 June 1852, 5 Aug. 1854, 27 Nov. 1861, 11 Aug. 1873, 23 June 1881, 12 Oct. 1886, 18 Dec. 1890, 16 April 1891, 24 June 1902; CN601-S187, 29 août 1825. Pierre B. Landry, “BAGG, STANLEY CLARK,” in Dictionary of Canadian Biography, vol. 10, University of Toronto/Université Laval, 2003–, accessed April 25, 2019, http://www.biographi.ca/en/bio/bagg_stanley_clark_10E.html.